On Friday nights, the usually tranquil settings of Café Time turn into a gypsy Bohemian gathering. That is when a local rumba flamenco band comes with dancers and supporters to the small downtown coffeehouse. 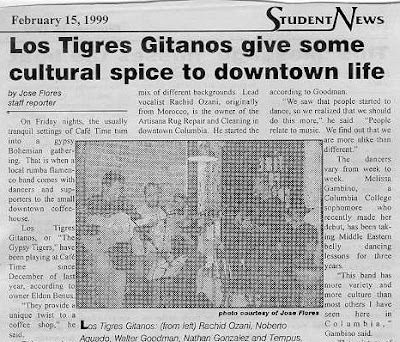 Los Tigres Gitanos, or “The Gypsy Tigers,” have been playing at Café Time since December of last year, according to owner Eldon Benus. “They provide a unique twist to a coffee shop,” he said. This unique twist comes in the form of rumba flamenco world music, which blends together rock, salsa and other Latin sounds. Benus described the group’s music as “light, something that is very easy to get into. Flamenco is very adaptable, very easy to pick up.” The band plays before a crowd of more than 30 people on average. “I think it was great,” said junior Jessica Pacheco, a foreign exchange student at MU. “It made me want to dance, and I love the fact that they play their own songs.” This was true for all but one of the songs the band played—the rumba flamenco classic “Bamboleo” by The Gypsy Kings. The song, released in 1987, has recently been used in a Burger King restaurant commercial, adding to its popularity in the United States. The group itself comes from a mix of different backgrounds. Lead vocalist Rachid Ozani, originally from Morocco, is the owner of the Artisana Rug Repair an d Cleaning in downtown Columbia. He started the band with Walter Goodman III, a senior at MU majoring in interdisciplinary studies. Goodman plays rhythm guitar and serves as the band’s promoter. Also playing rhythm guitar and singing vocals is Nathan Gonzalez. He is of Hispanic decent and is a senior at MU majoring in mechanical engineering. On flamenco guitar is Noberto Aguado, a descendant of Seville, Spain. He teaches Spanish at Jefferson Junior High and is married to MU Study Abroad Program advisor Lynn Aguado. The most mysterious member of the group is a man who simply goes by the name Tempus. He serves as the band’s percussionist and is a self-proclaimed “American gypsy.” The band got started in the spring of 1998 when Ozani and Goodman played “for the purpose of playing” on the streets of downtown, according to Goodman. “We saw that people started to dance, so we realized that we should do this more,” he said. “People relate to music. We find out that we are more alike than different.” The dancers vary from week to week. Melissa Gambino, a Columbia College sophomore who recently made her debut, has been taking Middle Eastern belly dancing lessons for three years. “This band has more variety and more culture than most others I have seen here in Columbia,” Gambino said. The mixture of the group brings together a variety of music styles, which is the essence of gypsy music. The African rumba drumbeats combined with the classical flamenco guitar rhythms of Sevilla, a province of Spain, produced what we now know as rumba flamenco. Because of their unique musical style, Los Tigres Gitanos is different from most bands in Columbia. “Columbia has a lot of punk, grunge, alternative and commercial bands,” said Memé Bassett, a Stephens College freshman who has lived in Columbia her entire life. “But before this, Columbia was a hippie community; wild entertainment with bands everywhere. This (band) is getting back to it, this is getting back to the spirit.’ Los Tigres Gitanos plays at 9 p.m. every Friday night at Café Time on 23 S. Ninth Street.